Forage: Perennial ryegrass is a valuable forage and soil stabilization plant. This species is the predominant forage grass in Europe and is used extensively in the United States. Perennial ryegrass is used for pasture and hay in sheep, dairy and beef production. It is often used in mixes with alfalfa, clovers and other grasses. Perennial ryegrass has the highestforage quality of all cool season grasses. Perennial ryegrass is a bunchgrass which grows from 1 to 2 feet tall, and has medium longevity. There are numerous long, narrow, stiff leaves near the base of the plant. The under surfaces of leaves are bright, glossy and smooth. Inflorescence stems are nearly naked. Seed heads are spikes with spikelets growing edgewise to the seed head stem. Seeds do not have awns (bristles). There are approximately 227,000 seeds per pound. These grasses have a wide range of adaptability to soils, but thrive best on fertile soils with a pH between 5.5 and 6.5. They produce well in regions having mild climates. They do not withstand hot, dry weather or severe winters. They will stand fairly wet soils with reasonably good surface drainage. Perennial ryegrass is distributed throughout the entire United States. Seed should be planted 1/4 to 1/2 inch deep in a well prepared seedbed. Spring seedings of ryegrass may occur in March, April, or May. Perennial ryegrass may also be seeded mid-August to early September. Generally, a rate of 30 to 40 pounds per acre is used if ryegrass is seeded alone. In mixtures, 6 to 10 pounds per acre is recommended, depending upon uses and companion species. In general, the perennial ryegrass component of a mix should be 20% or less since it is very competitive, due to rapid germination and good seedling vigor. 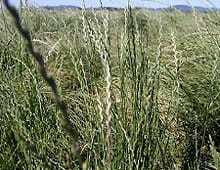 Ryegrass is generally cut for hay when seed heads start to emerge. Established perennial ryegrass-clover pastures should be rotationally grazed when spring growth is 3 to 6 inches high. Allowing 7 to 10 inches of regrowth between grazings will benefit yield and persistence. On new seedings, harvest or grazing should be delayed until plants are 10 to 12 inches tall. Ryegrass responds well to good management, such as intensive rotational grazing and fertilizer applications.